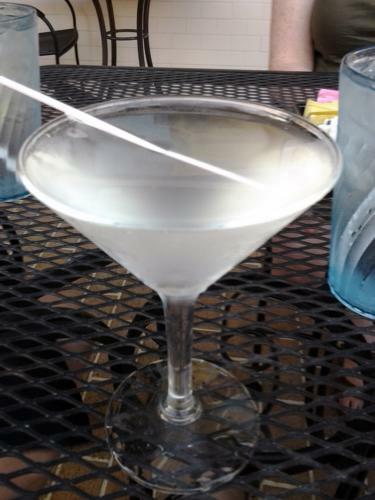 This translucent cocktail was a mix of pineapple Skyy vodka, white cranberry juice, and triple sec. A lemon twist was advertised as a garnish, but as is often the case with garnishes, it was left off the drink (stop doing this bartenders!). Somehow, the mix of cranberry juice and pineapple vodka made this drink come off with more of a coconut than pineapple flavor, which was pleasing. However, flavored vodkas often give a drink a watery, plastic mouthfeel that isn’t bad but certainly isn’t ideal. Occasionally, the combination of flavors can manage to disguise that, but this cocktail wasn’t one of those. It’d be a better drink using vodka with a few drops of pineapple, though that might have compromised the appearance of the drink. A refreshing, moderately tropical option for the summer!